Did you know that more than 80% of employees miss work each year due to "minor illnesses," such as cold and flu? Because cold and flu viruses are often spread by hand contact, Kleenex Brand has developed a tissue for your whole business. Each Kleenex Anti-Viral tissue has three soft layers, including a moisture-activated middle layer that kills 99.9% of cold and flu viruses in the tissue within 15 minutes. It's virucidal against Rhinoviruses Type 1A and 2 (rhinoviruses are the leading cause of the common cold), Influenza A and B (causes of the flu), Respiratory Syncytial Virus (RSV – the leading cause of lower respiratory infection in children). Each box comes with 68 germ-fighting tissues, and each features small blue dots on the interior layer, which signal they're antiviral. Research shows most people average 2.5 colds per year. 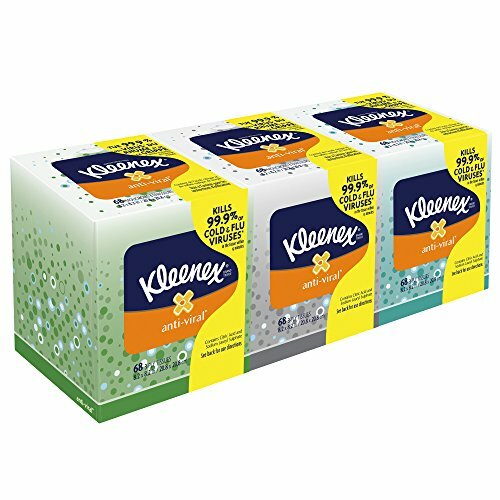 So whether you are a teacher caring for children, a commercial operator with a big staff or a business owner who cares about your employees' health, Kleenex Anti-Viral Facial Tissue can be an important part of keeping your crew healthy, year-round. Buy this three box pack in bulk, so you won't run out!